Tips for a Winter Trip to Shimla- To visit this fascinating place one needs to keep in mind certain points which are marked as significant if one is travelling to Shimla in winters to experience snowy-magical land.Moreover, to enjoy some of the unforgettable Shimla views and to enjoy snow activities in winters one must make a trip in December end and enjoy the carnival of the new year too. 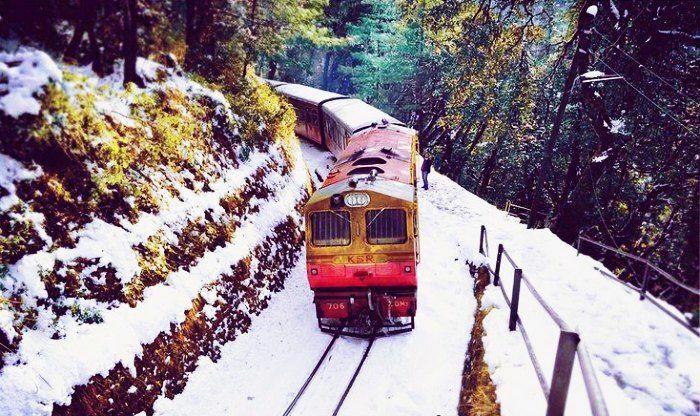 One should take a ride over the toy train from Kalka and enjoy throughout the scenic views of snowy magical land and then almost experience the ride over Jakhu Ropeway and enjoy the peace of landscapes in 6 minutes journey and visit the Jakhu temple too. Weather and Climatic Conditions- If you plan for Shimla then one should check the weather conditions especially if you are seeking for snowfall, one needs to plan at the end of December or January when you will find the temperature drop down to -2 degree Celsius, which is the condition of extreme winters.Since the temperature in the mountains can change anytime so one must carry winter wear with the regular clothes and one must have a watch over weather forecast before seeking to travel Shimla. Moreover, If you wish to visit areas with heavy snowfall, you may rent gumboots from a roadside, vendors are easily available on your way. Hotel staff and your driver will be able to guide you for the same. Hotel booking details and ID Proof – It is essential while going anywhere out of a station and you have a booking in the hotel then one must carry the id proof since the government has made this essential in order to stop fraudulent activities.Moreover, one should even carry the digital copies of the document in case of any loss or emergency, one must keep the digital copy in their mobile phones, in order to show at the time of check-in. Check Hotel Reviews – Before booking the hotel, one should see the reviews and check thoroughly about the hotel and other facilities, since it is the most relevant factor since one needs to be safe and secure throughout your stay.Please check the Hotel amenities and ratings before booking the hotel. If you may need add-ons like heater, extra beds, blankets, room refreshments and more, request your travel agent to customize your package before making the payments. 4. Health Precautions- If you are travelling to any hill station especially to Shimla, one must take special care and should not eat before travelling and should maintain a distance of at least 2 hrs, since the place is on a height and the routes are wavy which may make you feel dizzy, feeling of nausea and vomiting, due to travelling to a high altitude. Prefer bottled water for drinking purposes. 5. Follow instructions – If one plans for a trip especially in case of hill station one needs to follow the instructions as boarded over museums and national heritage and religious places such as Some buildings and monument (Indian Institute of Advanced Study, Shimla; Chail Palace) may require special permissions for photography or filming. District Administration & Tourism office will help you with the same. Hence, one needs to follow the state norms and ethics. 6. Safety Precautions- When planning for any hill station; one needs to follow the safety measures since water currents passed over the rivers, hence, one needs not be near to a cliff for the photograph; in order to avoid any happening in near future or throughout the journey. 7. Stay Prepared- The tourists must prepare themselves with all the analysis about the place, one should come prepared by researching, and should prepare prior in this manner.While if you planning for adventure trips, then one should ask for woollens. 8. Emergency numbers- One should keep a list of emergency numbers, where one is visiting, such as; police, ambulance, district control room Shimla, tourist information office Shimla. 9. Tour documents- One should check and pre-prepare all the documents as required at the time of check-in, booking details of the hotel, cab rental booking details in order to avoid any false happening. 10. Near to Marketplace- The tourists must book their residential near to marketplace which is known as the supreme place, near to market in order to avoid inconvenience and also one needs to maintain distance from the tourist guides in order to avoid indulgence in fraudulent activities. Moreover, one should not live where there is a threat from wildlife.